When it comes to putting meat on the dinner table, most people in American are turned off by the idea of eating anything other than pork, beef, chicken, or turkey. We love our meat, lots of meat, but most would never venture beyond the 4 animals previously stated. Foods that are common in other countries around the globe are strictly for "foodies" in the states. Rabbit is one of those animals that basically turns people off by the idea of eating them. Those bunnies are simply too cute to serve and are best kept in cages for children to enjoy as pets. But, raising rabbits can be part of a sustainable farming practice that does not require the vast amount of land that a cow would need and being herbivores, they are great for keeping your lawn nice and trim. 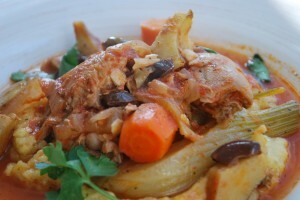 Rabbit is a lean protein rich food source high in minerals phosphorus and selenium. The trouble with rabbit is the lack of accessibility and therefore they are usually fairly costly. if you are lucky enough to find them at your local butcher shop or farmer's market, try to pick up a whole rabbit rather than one that is pre portioned. Butchering the rabbit, especially for this recipe is easy but if you need further guidance, check out the video linked here.. rabbit butchery. This recipe is influenced by my Italian heritage and is cooked slowly so that all the ingredients will help add a rich flavor to the lean meat of the rabbit. **In traditional Italian cooking, rabbit stew is often served over creamy polenta. The buttery slow cooked polenta is a perfect match and picks up the wonderful flavors from the broth. Keep in mind, that excess consumption of corn can lead to loss of B vitamins due to the anti-nutrients present in the ground corn. Pickling Lime can be mixed with water and then the ground corn can be soaked overnight. This allows niacin to become more readily available in the corn and therefore more nutritious. **Rabbit may not be available in your neighborhood, so pasture raised chicken will yield similar results and can be cooked using the same method. Heat a large skillet over medium high heat. Melt the fat and get it nice and warm. Season the rabbit pieces with sea salt and freshly cracked black pepper, then add to the hot pan. Gently sear both sides of the rabbit, then top with the sliced onions and chopped carrots. Add the white wine, reduce by half. Next, pour in the tomato sauce, add bay leaf and oregano. Cover with stock or water and cover all the ingredients by 1 inch. Bring to a simmer, then partially cover and cook for about 45 minutes. **Be mindful not to boil the liquid. After 45 minutes, add in the olives, artichokes and fennel, and continue to cook for 30-45 more minutes. At this point, the meat should easily flake from the bone. Season with sea salt and stir in some fresh parsley. Serve as is or over a small bowl of polenta.